Rejection of ectopic heart transplants expressing OVA requires OVA-specific CD4 and CD8 T cells. In the absence of CD4 T cells, OVA-specific CD8 T cells proliferate and migrate to the graft, but fail to develop cytolytic functions. With CD4 T cells present, clonal expansion of the CD8 T cells is only marginally increased but the cells now develop effector functions and mediate rapid graft rejection. In the presence of CD4 T cells, Ag and B7 levels do not increase on dendritic cells but IL-12 production is up-regulated, and this requires CD154 expression on the CD4 T cells. OVA-specific CD8 T cells lacking the IL-12 receptor fail to differentiate or mediate graft rejection even when CD4 T cells are present. Thus, CD4 T cells condition dendritic cells by inducing the production of IL-12, which is needed as the “third signal” for CD8 T cell differentiation and avoidance of tolerance. ACD8 T cell immune response can be dissected into specific phases: proliferation and clonal expansion, differentiation and development of effector functions, and the generation of a stable memory population. Until recently, clonal expansion of a population of Ag-specific CD8 T cells has been taken to indicate the development of effective CD8 immunity. However, studies of TCR transgenic T cells have revealed that clonal expansion can occur even when the outcome of the immune response is unresponsiveness or clonal deletion (1). In fact, a number of recent studies have shown that development of CTL activity can be uncoupled from the initial proliferation and clonal expansion (2, 3, 4). The difference between T cell immunity and tolerance has been attributed to the quality of the signals delivered by the APC, usually a dendritic cell (DC).2 For example, DCs that process apoptotic cell-associated Ag are suboptimally activated and unable to induce immunity (5), whereas DCs activated directly through ligation of TLRs on their surface are able to promote immunity (6). The efficacy of an APC in promoting the development of CTL activity has been linked with its ability to express costimulatory molecules (signal 2) and peptide-MHC class I complexes (signal 1) on its cell surface. However, recent data have suggested that signal 1 and signal 2 can be sufficient to stimulate proliferation and clonal expansion, but that a third signal delivered early in the response is essential for naive CD8 T cells to develop optimal effector function (7). IL-12 can provide this necessary third signal both in vitro (8) and in vivo (9), and the CD8α+ DC subset known to be critical for the presentation of Ag to naive CD8 T cells can produce IL-12 upon activation (10, 11, 12). CD4 T cell help for CD8 T cells is important for responses to some bacterial and viral infections (13), and it has also long been recognized that the rejection of a solid organ mismatched for minor Ags is dependent on the participation of both CD4 and CD8 T cells (14). The mechanism(s) by which CD4 T cells participate in the development of an effective CTL response has not been clearly defined. There is evidence that CD4 T cell help is mediated by CD154 on the CD4 T cell binding to CD40 on APC to render the APC competent to effectively stimulate naive CD8 T cells (15, 16, 17, 18). Activation of DC through CD40 has been shown to increase the expression of costimulatory molecules on the DCs (19). Although this up-regulation of costimulatory molecules may be important, it does not appear to be sufficient to render the DC competent to fully stimulate naive CD8 T cells to develop effector functions (2, 20, 21). Ligation of CD40 on DCs can stimulate production of IL-12, raising the possibility that CD4 T cell help also involves activating the DCs to produce IL-12 and thus provide the third signal needed for the development of CD8 effector functions. To elucidate the mechanism by which CD4 T cells provide help for CD8 T cell-dependent graft rejection, we have used an adoptive transfer model to study the responses of graft Ag-specific TCR transgenic CD8 (OT-I) and CD4 (OT-II) T cells (22). As graft donors, we used mice transgenic for a membrane-bound form of OVA (mOVA) driven by a ubiquitously expressing actin promoter (Act-mOVA mice) (22). OVA thus acts as a minor Ag, and syngeneic mice that receive heterotopic Act-mOVA heart transplants rapidly reject the grafts, but only if they receive both OT-I and OT-II T cells by adoptive transfer before transplantation. The graft-specific T cells can be enumerated and characterized during the course of the response, and the results obtained using this approach provide strong support for a model in which the help provided by CD4 T cells proceeds via CD154-dependent IL-12 production by DCs. The IL-12 secreted by this mechanism is the required third signal that supports CD8 T cell differentiation and development of effector functions. Transgenic mice expressing membrane-bound chicken OVA (Act-mOVA) were generated by the University of Minnesota Mouse Genetics Laboratory (22). C57BL/6 (B6), B6.CD4-deficient, and B6.I-Abβ-deficient mice were purchased from the National Cancer Institute (Frederick, MD). B6.PL (CD90.1 congenic), B6.SJL (CD45.1 congenic), B6.CD154-deficient, and IL-12Rβ1-deficient mice were purchased from The Jackson Laboratory. OT-II B6.PL RAG-deficient transgenic mice were provided by A. Khoruts (University of Minnesota, Minneapolis, MN). OT-I B6.SJL RAG-deficient transgenic mice were provided by M. K. Jenkins (University of Minnesota). OT-I IL-12Rβ1-deficient mice were crossed to OT-I mice with IL-12Rβ1-deficient mice and bred to homozygosity. The mouse colony is maintained under specific pathogen-free conditions at the University of Minnesota. Experiments were performed in compliance with institutional guidelines and with the approval of the Institutional Animal Care and Use Committee of the University of Minnesota. The following fluorochrome- or biotin-labeled reagents were purchased from BD Pharmingen, Caltag Laboratories, or Biolegand: anti-CD90.1, anti-CD90.2, anti-CD45.1, anti-CD4, anti-CD8α, anti-TCR Vα2, anti-TCR Vβ5.1, anti-CD25, anti-CD11c, anti-I-Ab, anti-B7.1, anti-B7.2, and anti-IFN-γ, and anti-granzyme B Abs and streptavidin. Recombinant murine IL-12 (Genetics Institute, Cambridge, MA) was injected i.p. at a dose of 1.0 μg on days 2 and 3 after grafting. The heterotopic heart transplant procedure is adopted from the procedure performed in rodents (23). Rejection was scored when the engrafted heart ceased beating as determined by abdominal palpation. Lymph nodes with or without spleens were harvested from OT-I B6(CD45.1)RAG−/−, OT-I B6IL-12Rβ1−/−, OT-II B6(CD90.1)RAG−/−, or OT-II B6(CD90.1/90.2)CD154−/− mice and mechanically disrupted to create a single-cell suspension. The percentages and total numbers of CD8+Vα2+ Vβ5.1 OT-I cells or CD4+Vα2+ Vβ5.1 OT-II cells were determined by three-color flow cytometry (22). 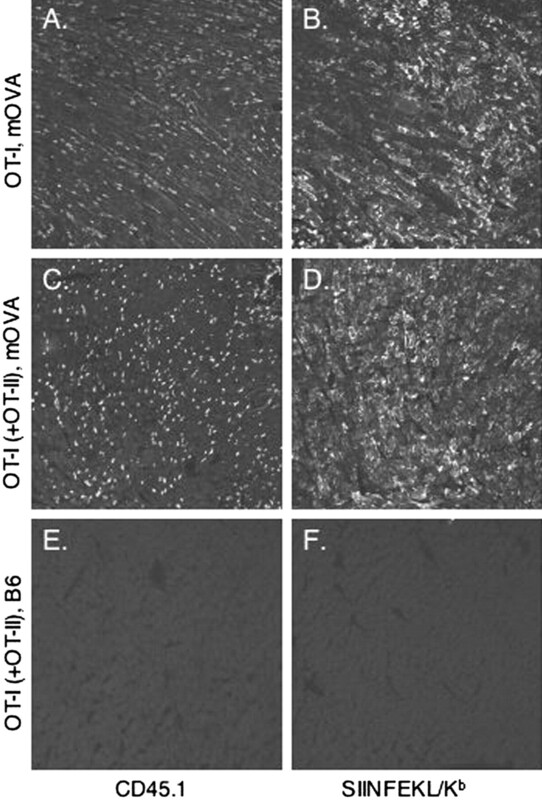 Unmanipulated B6 or B6.PL mice then received 1–2 × 106 OT-I and/or OT-II cells via the tail vein. In some experiments, OT-I and OT-II cells were labeled with CFSE (Molecular Probes) before transfer as previously described (24). Single-cell suspensions of heart graft-infiltrating cells were obtained after mechanical disruption of heart grafts by incubating tissue with 400 U/ml collagenase D (Roche Molecular Products) in the presence of brefeldin A (Sigma-Aldrich) for 20 min at 37°C in 5% CO2 and then briefly with 0.1 mM EDTA. 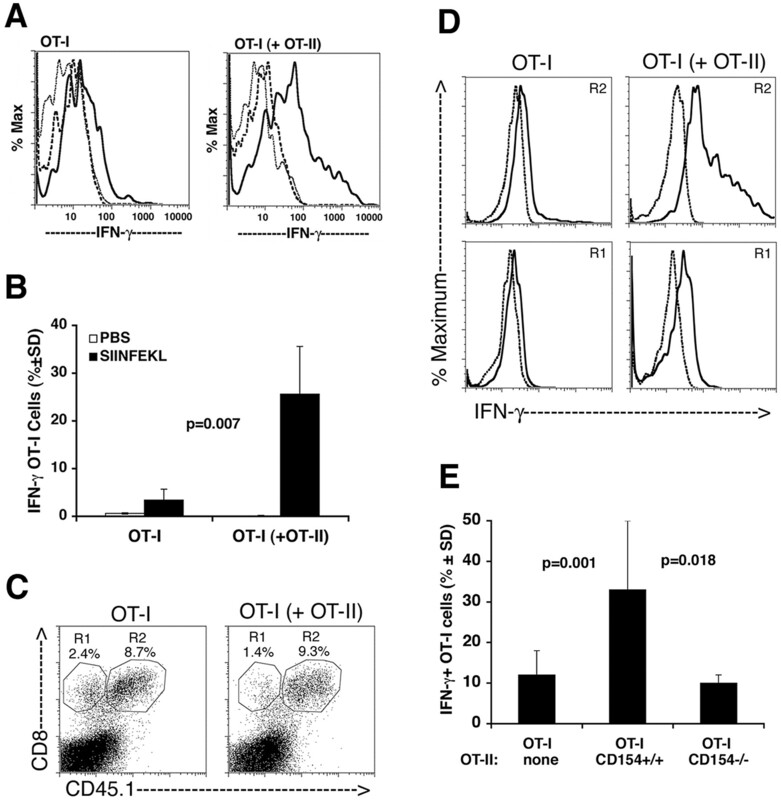 Single-cell suspensions were stained with fluorochrome-labeled anti-CD45.1, anti-CD8α, and anti-TCR-Vα2, or anti-CD90.1, anti-CD4, and anti-TCR-Vα2 Abs to detect transferred OT-I and OT-II cells (22) and anti-CD11c and anti-I-Ab to identify DCs. For intracellular staining, cells were fixed in 2% formaldehyde, permeabilized with saponin, and stained with fluorochrome-labeled anti-IFN-γ, anti-granzyme B, or anti-IL-12 (25). A BD Biosciences FACSCalibur flow cytometer was used for acquisition and either CellQuest (BD Biosciences) or FlowJo (Tree Star) software was used for analysis. At least 50,000 total events or 500 OT-I events were collected for analysis. The total number of OT-I or OT-II cells was calculated by multiplying the percentage of CD8+ CD45.1+ Vα2+ cells or CD4+CD90.1+Vα2+ cells by the total number of viable lymphocytes determined by trypan exclusion. In some cases the total number of cells was determined relative to a standard number of PKH26 fluorescent beads (Sigma-Aldrich). Heart grafts were embedded in OCT compound (Allegiance Health Care) and snap frozen in precooled isopentane. Serial 10-μm sections were acetone dehydrated and sequential staining using biotin-labeled anti-CD45.1 (to detect OT-I cells) or anti-SIINFEKL/Kb (25.D-1.16) and tyramide amplification was performed as previously described (22, 26) according to the manufacturer’s protocol (PerkinElmer Life and Analytical Sciences). Immunofluorescent microscopic images were acquired using a Bio-Rad MRC-1000 confocal microscope equipped with a krypton/argon laser and COMOS version 7.0a software (Bio-Rad Life Sciences). Image processing was done using Confocal Assistant and Photoshop 7 (Adobe Systems) software. Splenocytes from B6 mice were incubated with SIINFEKL peptide or PBS. The populations were dye labeled with 0.5 and 5.0 μM CFSE, respectively. Ten to 20 million cells of each population were coinjected i.v. (tail vein) into recipients. Spleens were harvested 16 h later and assayed by flow cytometry for the presence or absence of the CFSE-labeled populations. One thousand CFSEhigh events were counted and the number of CFSElow events collected was determined. The percent killing was determined by the calculation 1− [(CFSElow events)/(CFSEhigh control events)] × 100. Single-cell suspensions of DCs were obtained after mechanical disruption of spleens or lymph nodes by incubating tissue with 400 U/ml collagenase D in the presence of brefeldin A for 20 min at 37°C in 5% CO2 and then briefly with 0.1 mM EDTA. DCs were enriched from the single-cell suspensions using anti-CD11c microbeads according to the manufacturer’s protocol (Miltenyi Biotec). The enriched population was stained for the presence of B7.1, B7.2, or SIINFEKL-Kb on the cell surface by flow cytometry or incubated at 37°C in 5% CO2 in the presence of brefeldin A for 120 min and then stained for the presence of IL-12 within the cells by flow cytometry. DCs were identified as CD11c+I-Ab+. To examine the role of CD4 help in activating graft-specific CD8 T cells, we used a well-defined system in which the donor and recipient differ in the expression of a single protein, OVA, by transgenic expression of mOVA under the control of the actin promoter (Act-mOVA) (22). Rejection of a heterotopically placed Act-mOVA heart graft in normal recipients is dependent upon adoptive transfer of TCR transgenic CD4 (OT-II) (27) and CD8 (OT-I) (28) T cells specific for OVA peptides 323–339/I-Ab and 257–264/Kb, respectively. C57BL/6 mice i.v. injected with 1–2 × 106 OT-I and 1–2 × 106 OT-II cells before transplantation rapidly reject heterotopic Act-mOVA heart grafts (80% within 2 wk as measured by cessation of beats by abdominal palpation) while rejection by mice that receive OT-I cells alone (0%) or OT-II cells alone (33%) is much less frequent (Fig. 1⇓). These mice have been followed for >70 days with similar results. Since expression of CD40L (CD154) on CD4 T cells has been shown to be important for mediating help to B cells (29) and CD8 T cells (17), we investigated the role of CD154 expression on OT-II cells in mediating graft rejection. We found that CD8 T cell-dependent rejection of Act-mOVA heart grafts requires help from CD4 T cells that express CD154; CD154-deficient CD4 T cells cannot provide the necessary help (Fig. 1⇓). To investigate the basis for this CD154-dependent CD4 T cell help, we examined the CD8 T cell responses necessary for graft rejection; proliferation and clonal expansion, migration to the graft, and development of effector functions. Act-mOVA heterotopic heart graft rejection is CD4 T cell help dependent. Wild-type B6 mice were transferred with OT-I cells only (□, n = 7), OT-II cells only (•, n = 6), OT-I and OT-II cells (▪, n = 12), OT-I- and CD154-deficient OT-II cells (○, n = 5), or left untransferred (▵, n = 7) before receiving a heterotopic Act-mOVA heart graft (day 0). Proliferation of naive OT-I and OT-II cells after Act-mOVA heart transplantation occurs initially in secondary lymphoid tissues within 2–3 days of transplantation, similar to what has been observed in other systems (22, 30, 31). OT-I cells within spleens do not need help from OT-II cells to become activated, as evidenced by increased expression of CD25 (Fig. 2⇓, A and B), or to clonally expand, as evidenced by CFSE dye dilution (Fig. 2⇓A) and by increased total numbers of OT-I cells (Fig. 2⇓C). 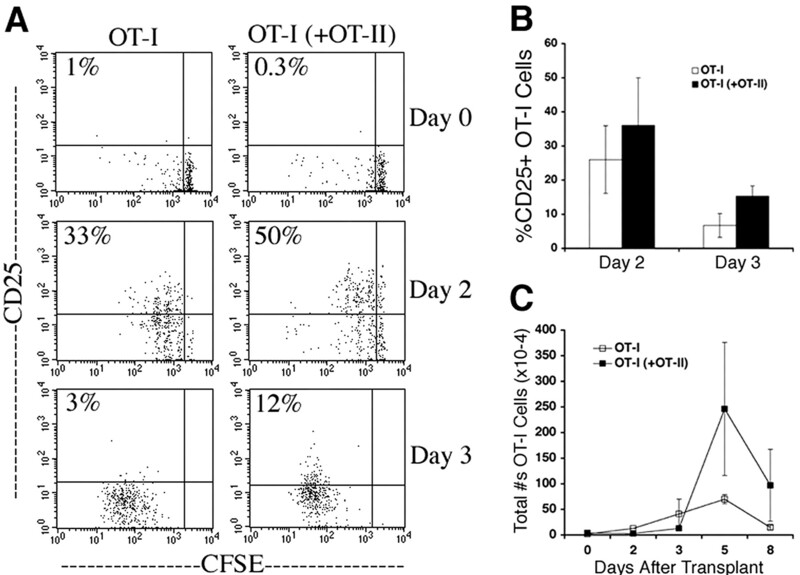 However, the presence of OT-II cells may result in somewhat more sustained activation of the OT-I cells, as evidenced by more prolonged CD25 expression (Fig. 2⇓B), and somewhat greater expanded numbers of the OT-I cells (Fig. 2⇓C). Although small, these differences were seen in six independent experiments. Similar results were observed in mesenteric and peripheral lymph nodes (data not shown). The OT-II cells in this system demonstrate similar activation and expansion, albeit to a lesser degree, and with a similar time course (data not shown). Proliferation of OT-I cells in the absence of OT-II cells cannot be attributed to endogenous CD4 T cell help since similar results were obtained using CD4-deficient recipients and MHC class II-deficient recipients (data not shown). Thus, activation, proliferation, and clonal expansion of graft-specific CD8 T cells in secondary lymphoid tissue in response to graft Ag does not require CD4 T cell help. Proliferation of OT-I cells is independent of CD4 T cell help. Wild-type B6 mice were i.v. injected with OT-I cells alone (n = 3) or in combination with OT-II cells (n = 3) before receiving Act-mOVA heart grafts (day 0). Spleens were harvested at the indicated time points after grafting. A, OT-I cells (CD8+, CD45.1+, Vα2+) are analyzed for CFSE content (x-axis) and CD25 expression (y-axis). B, Mean percent ± SD of CD25 expression of OT-I cells obtained from spleens at the indicated time points after Act-mOVA heart transplant. These data are representative of three independent experiments. C, Total numbers ± SD of OT-I cells obtained from spleens at the indicated time points after heterotopic heart transplant. These data are representative of six independent experiments. Identical results were observed upon analysis of peripheral lymph nodes (data not shown). Once activated, T cells leave secondary lymphoid tissues and migrate to the periphery where they are able to locate and destroy their target Ag. It was possible that OT-I T cells activated in the absence of OT-II cells might be defective in their migratory ability or, alternatively, that the target Ag for the OT-I cells was not present in the heart grafts. The presence of OT-II cells within heart grafts could influence the expression of target Ag through secretion of cytokines such as IFN-γ. Either possibility might explain the prolonged graft survival in the absence of graft-specific CD4 T cell help. To examine these possibilities, we analyzed the heart grafts to determine whether OT-I cells are present and whether the target SIINFEKL-Kb complex is also present (Fig. 3⇓). OT-I cells were not observed in the grafts between days 0 and 3 (data not shown), confirming that the initial activation of the naive CD8 cells does not occur within the vascularized graft itself (31), but instead within secondary lymphoid organs (Fig. 2⇑). OT-I cells appeared within the grafts by day 5 whether or not OT-II cells were present during their initial activation (Fig. 3⇓, A and C). The target Ag of the OT-I cells was expressed by the graft tissue at this time, as demonstrated by the detection of SIINFEKL-Kb complexes using the mAb 25.D-1.16 (32) (Fig. 3⇓, B and D). Again, similar results were obtained using CD4 and MHC class II-deficient recipients (data not shown). Thus, OT-I cells undergo clonal expansion in secondary lymphoid tissue and migrate to the graft in the absence of help from CD4 T cells, but fail to mediate graft rejection even though the target Ag is expressed on the graft tissue. This suggested that despite being activated to proliferate and migrate, the OT-I cells might fail to develop effector functions in the absence of CD4 T cell help. We therefore examined the two primary CTL effector functions, production of IFN-γ and cytolytic activity. Migration of graft-specific CD8 T cells to the heart and expression of target Ag in the grafts is independent of CD4 T cell help. B6 mice were i.v. injected with OT-I cells alone or along with OT-II cells before receiving Act-mOVA (A–D) or syngeneic B6 (E and F) heart grafts. Heart grafts were harvested 5 days after transplantation. Adjacent sections were stained with anti-CD45.1 to identify OT-I cells (A, C, and E) and anti-SIINFEKL/Kb to identify the target Ag (B, D, and F). We tested the ability of the clonally expanded OT-I cells in the periphery on day 8 to produce IFN-γ in response to Ag (Fig. 4⇓). SIINFEKL peptide was administered i.v. 8 days after Act-mOVA heart transplantation, spleens were harvested 6 h later, and the intracellular content of IFN-γ in the OT-I cells was determined. OT-I cells activated in the presence of OT-II cells were found to produce substantially more IFN-γ in response to SIINFEKL peptide challenge than did OT-I cells activated in the absence of OT-II cells (Fig. 4⇓, A and B). Without a peptide challenge, OT-I cells did not make IFN-γ (Fig. 4⇓, A and B), suggesting that there is little to no Ag within secondary lymphoid tissue at this time. Production of IFN-γ by CD8 T cells requires CD154+ OT-II cells. A and B, B6 mice were i.v. injected with OT-I cells alone (n = 4) or along with OT-II cells (n = 3) before receiving Act-mOVA heart grafts (day 0). 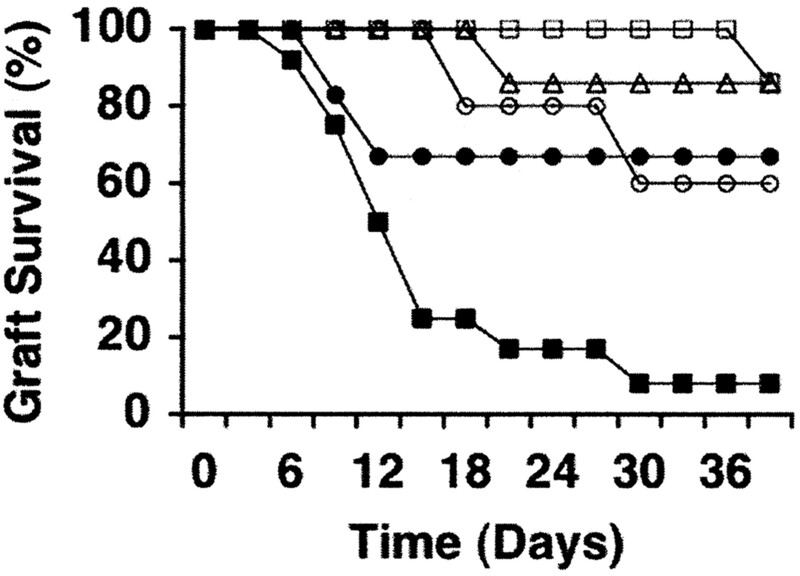 On day 8, mice were injected with 25 μg of SIINFEKL peptide or PBS, and the spleens were harvested 6 h later. A, Representative histogram plot of IFN-γ (solid and dashed lines) or isotype control (dotted line) staining of OT-I cells (CD8+, CD45.1+) after SIINFEKL peptide (dotted and solid lines) or PBS (dashed lines) injection. B, Mean percent ± SD of IFN- γ production in OT-I cells. Values were calculated by subtracting isotype control staining. These results were repeated in two independent experiments. C–E, B6 mice were i.v. injected with OT-I cells alone (n = 10) or in combination with CD154+/+ OT-II cells (n = 10) or CD154−/− OT-II cells (n = 4) before receiving Act-mOVA heart grafts (day 0). Grafts were harvested on day 5 and enzyme digested. C, Dot plot of graft-infiltrating OT-I cells (R2: CD8+, CD45.1+) and endogenous CD8 T cells (R1: CD8+, CD45.1−). D, Histogram of IFN-γ (solid line) or isotype control (dotted line) staining of graft-infiltrating OT-I cells (upper panels) or endogenous CD8 T cells (lower panels). E, Mean percent ± SD of IFN-γ+ OT-I cells. Values were calculated by subtracting isotype control staining. Represented is pooled data from four independent experiments. We also examined IFN-γ production by graft-infiltrating OT-I cells on day 5 without exogenous administration of Ag. This time point was chosen because at later times some of the grafts in mice that receive both OT-I and OT-II cells stop functioning and are severely damaged by acute rejection (loss of myocyte nuclei examined by histological staining), making a comparison with the OT-I only group difficult. In addition, we know that similar amounts of SIINFEKL-Kb complexes are expressed in the grafts at this time point (Fig. 3⇑, B and D). Transferred OT-I cells were distinguished from endogenous CD8 T cells in the graft as the CD45.1+CD8+ cells (Fig. 4⇑C), and OT-I cells responding in the presence of OT-II cells were found to produce substantially more IFN-γ than OT-I cells responding in the absence of OT-II cells (Fig. 4⇑D). Endogenous CD8 T cells account for only ∼10–20% of the CD8 T cells infiltrating the grafts (CD45.1−CD8+ cells, Fig. 4⇑C) and these also produced more IFN-γ when responding in the presence of OT-II cells, suggesting that the OVA-specific CD4 T cells help those cells as well. The ability of OT-II cells to provide help to support IFN-γ production by the OT-I T cells was CD40L dependent, as demonstrated by the finding that graft-infiltrating OT-I cells produced little IFN-γ when OT-II cells deficient for CD154 were cotransferred (Fig. 4⇑E). We also examined the cytolytic effector status of OT-I cells in graft recipients that either did or did not receive OT-II T cells. The ability of the cells to act as cytolytic effectors was determined using in an in vivo killing assay (33). Twenty-eight days after grafting, mice received an i.v. injection of equal numbers of SIINFEKL-pulsed and unpulsed C57BL/6 splenocytes, with the two populations distinguished by a 10-fold difference in the level of labeling with the fluorescent dye CFSE (33). Sixteen hours later, spleen cells were harvested and analyzed to determine the relative numbers of remaining CFSE-labeled targets. 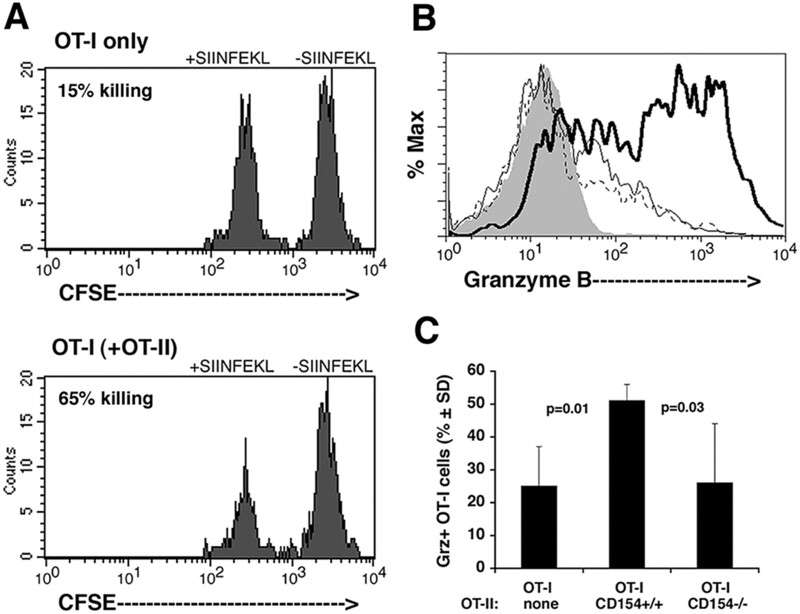 OT-I cells that had responded to the graft in the presence of OT-II cells were able to lyse the SIINFEKL-pulsed targets, whereas in the absence of OT-II cells minimal killing was found (Fig. 5⇓, A and B). This lack of killing was not due to deletion of the OT-I cells since the numbers of OT-I cells within the spleens of the mice were comparable (data not shown). CD8 T cell-mediated cytolysis is dependent on CD4 T cell help. A, B6 mice were i.v. injected with OT-I cells alone or in combination with OT-II cells before receiving Act-mOVA heart grafts (day 0). SIINFEKL-pulsed (CFSE-labeledlow) and PBS-pulsed (CFSE-labeledhigh) B6 splenocytes were coinjected into the indicated recipient mice 28 days after transplant. Spleens were harvested after 16 h and analyzed for the specific loss of CFSElow splenocytes as described in Materials and Methods. There was no significant killing of splenocytes in Act-mOVA-grafted mice that did not receive transgenic T cells. B and C, B6 mice were i.v. injected with OT-I cells alone or along with wild-type or CD154−/− OT-II cells before receiving Act-mOVA heart grafts (day 0). Grafts were harvested on day 5 and enzyme digested. B, Histogram of granzyme B (Grz) staining of OT-I cells (CD8+CD45.1+) when B6 mice were i.v. injected with OT-I cells alone (solid line) or OT-I cells and OT-II cells (solid, bold line) or OT-I cells and CD154-deficient OT-II cells (dashed line). Control staining is shown (filled histograms). C, Mean ± SD of granzyme B+ OT-I cells in the conditions indicated (n = 4/condition). To further examine the cytolytic potential of OT-I cells in the grafts, the expression of granzyme B was examined. Granzyme B is involved in the perforin-dependent degranulation mechanism of killing, and its expression level correlates well with cytolytic activity (34). OT-I cells present in the grafts at day 5 expressed much higher levels of granzyme B when OT-II cells were also present in the mice (Fig. 5⇑, B and C). Furthermore, increased expression of granzyme B by the OT-I cells required that the OT-II cells express CD154 (Fig. 5⇑C). Taken together these data demonstrate that OT-I cells proliferate and clonally expand in response to graft Ag in the absence of CD4 T cell help, but that acquisition of the ability to produce IFN-γ and mediate cytolysis requires help from CD154+ CD4 T cells. Proliferation without acquisition of effector function is a characteristic of CD8 T cells that are activated by Ag and costimulation in the absence of a third signal that can be provided by IL-12 (3, 20). We therefore examined the potential involvement of IL-12 in OT-I T cell activation and graft rejection. To begin to address the potential role of IL-12 in the ectopic Act-mOVA heart transplant model, we used IL-12 unresponsive OT-I cells (IL-12Rβ1-deficient OT-I cells) and found prolonged graft survival even when OT-II cells were present to provide help (Fig. 6⇓A). The IL-12 unresponsive OT-I cells in the Act-mOVA heart grafts also failed to up-regulate IFN-γ production when OT-II cells were present in the mouse (Fig. 6⇓B). Thus, OT-I cells must be able to respond directly to IL-12 to develop effector function and mediate graft rejection in a CD154+ CD4 T cell help-dependent manner. IL-12 can replace CD4 T cell help. A, Act-mOVA graft survival of mice transferred with wild-type OT-I cells and given rIL-12 on days 2 and 3 (n = 5, ▪) or IL-12Rβ1-deficient OT-I cells and wild-type OT-II cells (n = 6, □). B, B6.PL mice were i.v. injected with wild-type OT-I cells alone (n = 4), wild-type OT-I cells and OT-II cells (n = 4), or IL-12Rβ1−/− OT-I cells in combination with OT-II cells (n = 5) before receiving Act-mOVA heart grafts (day 0). Percent IFN-γ staining of OT-I cells (CD8+CD90.2+) within grafts 5 days after transplantation is shown. Values were calculated by subtracting isotype control staining. C and D, B6 mice were i.v. injected with OT-I cells alone (dotted line), OT-I cells and rIL-12 (solid line), OT-I cells and OT-II cells (bold, solid line), OT-I cells and CD154-deficient OT-II cells (dashed lines), and OT-I cells CD154-deficient OT-II cells and rIL-12 (bold, dashed lines) before receiving Act-mOVA heart grafts (day 0). Representative histogram plots of two mice in each condition for IFN-γ (C) and granzyme B (D) staining of OT-I cells (CD8+CD90.2+) within grafts 5 days after transplantation are shown. Filled histograms represent isotype control staining. Conversely, we found that in vivo administration of IL-12 on days 2 and 3 after transplantation could replace CD4 T cell help to promote graft rejection that was similar in tempo to the rejection caused by OT-I and OT-II cells together (Fig. 6⇑A; cf with Fig. 1⇑). 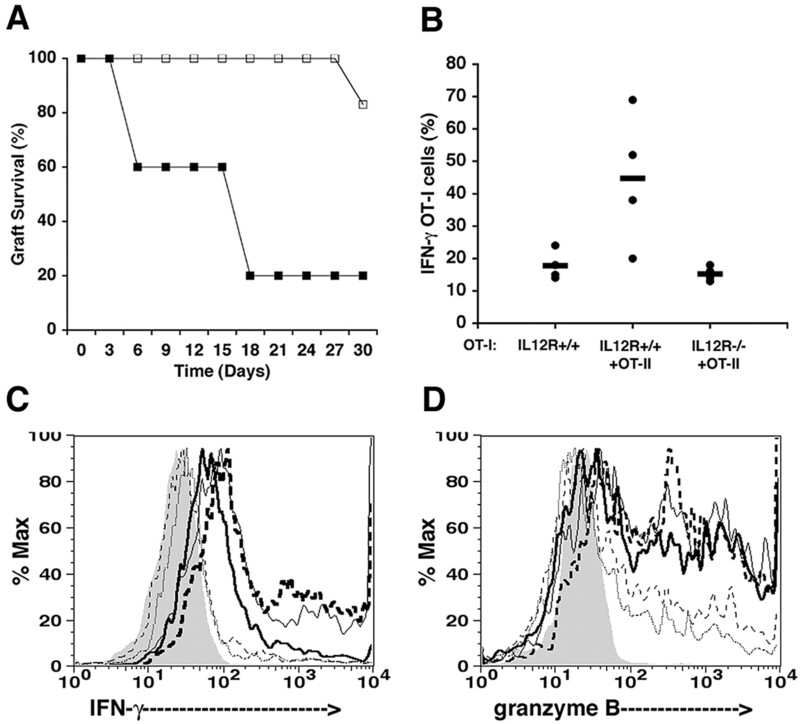 Furthermore, administration of IL-12 caused up-regulation of IFN-γ production and granzyme B expression by OT-I cells in the grafts on day 5 to levels comparable to those induced by OT-II CD4 T cell help (Fig. 6⇑, C and D). When both OT-I- and CD154-deficient OT-II cells were transferred, IFN-γ production and granzyme B expression in OT-I cells within grafts were low (Fig. 6⇑, C and D), as described above, and administration of IL-12 also restored these effector functions in this situation (Fig. 6⇑, C and D). Thus, exogenous IL-12 can replace the requirement for CD154+ CD4 T cell help in inducing OT-I effector functions and graft rejection. These results suggest that help from OT-II CD4 T cells may involve up-regulation of IL-12 production by DCs in a CD154/CD40-dependent manner, and this was investigated. To determine whether OT-II T cells stimulated production of IL-12 by DCs after Act-mOVA heart transplantation, splenic DCs were isolated on day 2 after transplantation, permeabilized, and stained with anti-IL-12 Ab. Direct ex vivo analysis of the DCs failed to demonstrate IL-12 under any transplant conditions. However, after in vitro culture for 2 h with no additional stimulation in the presence of brefeldin A, the DCs from OT-II-bearing mice consistently produced more IL-12 than those from mice that did not receive OT-II cells (Fig. 7⇓A). Similar results were found at day 3 and within DCs isolated from mesenteric lymph nodes (data not shown). Consistent with the inability of CD154-deficient OT-II cells to provide help for graft rejection or OT-I effector functions; DCs from mice that received these cells had background levels of IL-12 staining (Fig. 7⇓A). Direct ex vivo analysis without any in vitro culture of these same DCs demonstrate similar levels of the peptide-MHC class I complex (signal 1) (Fig. 7⇓B) and costimulatory molecules (signal 2) such as B7.2 (Fig. 7⇓C). Similar results were found with B7.1 (data not shown). This data suggest that graft-specific CD4 T cells can provide a CD154/CD40-dependent stimulus to induce DCs to produce IL-12. The DCs ability to support the development of effector functions of graft-specific CD8 T cells is dependent on the production of IL-12 (signal 3) and not on differences in the levels of signal 1 and signal 2. CD154+ CD4 T cells induce IL-12 production by DCs. B6 mice were i.v. injected with OT-I cells alone (solid line), OT-I cells and wild-type OT-II cells (bold solid line), and OT-I cells and CD154-deficient OT-II cells (dashed line) before receiving Act-mOVA heart grafts (day 0). 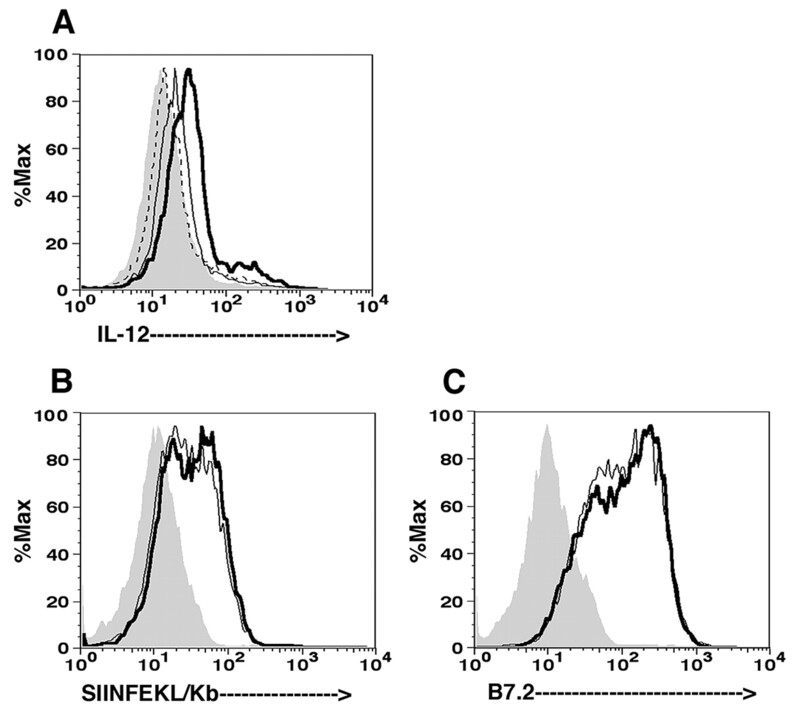 Representative histogram plots of two mice in each condition for IL-12 staining (A), SIINFEKL/Kb staining (B), or B7.2 staining (C) of DCs (CD11c+I-Ab+) are shown. Filled histogram represent control staining. These results were repeated in two independent experiments. Rejection after solid organ transplant remains a significant risk for solid organ transplant recipients. The use of potent immunosuppressive medication to blunt the rejection process has resulted in less acute graft losses but more infectious and malignant complications. Thus, induction of tolerance remains the ultimate but still elusive goal. It is unlikely that a single therapy will induce long-lasting immune tolerance but rather multiple drugs that target various arms of the immune system will be necessary. Deciphering at a molecular level how each immune cell participates in the rejection process will contribute to the tolerance-inducing drug mixture yet to be developed. In this study, we used a newly developed murine transplant model to study the coordinated efforts between CD4 and CD8 T cells in the development of an effective CTL response. In this system, the rapid rejection of a heterotopically placed heart graft is dependent on the presence of a small but significant population of adoptively transferred graft Ag-specific TCR transgenic CD4 and CD8 T cells (Fig. 1⇑). This system enables us to dissect the cellular and molecular mechanisms involved in the rejection process of a single foreign protein expressed on the grafted organ. The ubiquitous expression of the neo-Ag mimics clinical allograft conditions where MHC class I mismatches determine rejection. We are able to assess the phenotype and function of these specific T cells and the effect of these cells on a disease outcome (graft rejection). Generation of CD8 effector cells has been shown to be either dependent or independent of CD4 T cell help, depending on the system being examined. CD4 T cell-dependent help is thought to be important for noninfectious CD8-mediated responses such as that observed in the rejection of minor histocompatibility Ags, tumor Ags, and soluble proteins (13). Evidence in the literature exists to suggest that the mechanism of CD4 T cell help is either mediated through activation of an APC or by direct CD4-CD8 T cell contact. Interaction of CD40L (CD154) on activated CD4 T cells with CD40 expressed on APCs (15, 16, 17) or CD8 T cells (35) has been thought to mediate this function. Ligation of CD40 on DCs increases their T cell stimulatory capacity and this is thought to be due to up-regulation of costimulatory molecules such as B7 (19). The inability of immature or unconditioned DCs to promote immunity has been attributed to lower levels of costimulatory molecules expressed on these DCs compared with activated or mature DCs. However, recent data have suggested that up-regulation of costimulatory molecules such as B7 is insufficient to promote CD8 T cell effector function (3, 7, 20, 36). Our data support the notion that proliferation and clonal expansion of CD8 T cells is independent of CD4 T cell help (Fig. 2⇑) but the development of cytolytic function is dependent on the presence of activated CD4 T cells. In fact, the ability to reject Act-mOVA grafts (Fig. 1⇑) and to assist in the development of CTL function (Figs. 4⇑ and 5⇑) requires the expression of CD154 (CD40L) on the CD4 helper cell. Thus, in the absence of CD4 T cell help, the CD8 T cells proliferate, clonally expand, and are able to migrate (Fig. 3⇑) to the graft but the ability to destroy the graft is defective despite the abundance of expressed Ag. In contrast to the effector function, the ability to migrate to the graft is independent of the CD40 pathway (data not shown). Thus, in this situation migration and effector function are uncoupled and graft infiltration does not predict graft destruction. Whether the infiltration of noncytolytic graft-specific T cells is beneficial to the graft is unclear. Being able to distinguish between a destructive and noncytolytic T cell infiltrate would have relevance in a clinical setting. CD8 T cells that do not receive a third signal in addition to signal 1 and signal 2 fail to develop cytolytic function and by default become unresponsive (36). IL-12 can provide this third signal in vitro and in vivo (9, 36), but whether it does so during helper-dependent immune response has not been determined. This appears likely, since activated DCs can produce IL-12 and IL-12 can be important in the development of antiviral immunity (37) and autoimmune disease (4, 38, 39). Our data indicate that IL-12 is important for helper-dependent immune responses. The ability of IL-12 to replace CD4 T cell help or overcome the CD154−/− lack of help to promote graft rejection and the production of IFN-γ and granzyme B by OT-I cells confirms the importance of IL-12 (Fig. 6⇑). Preventing the ability of CD8 T cells to respond to IL-12 produced a situation where graft rejection is prevented despite the presence of CD154+/+ CD4 T cell help. Taken together, these data demonstrate that CD40L-mediated CD4 help is essential for the development of CTL activity and depends upon IL-12β1 receptor signaling on the CD8 T cell (Fig. 6⇑). Furthermore, the results strongly suggest that CD4 Th cells induce IL-12 production by DCs in a CD154-dependent manner (Fig. 7⇑). Thus, our results demonstrate that CD154 expressed on the helper cell is acting to up-regulate IL-12 production by the DCs and that the CD8 T cell needs IL-12 to respond. Bourgeois et al. (35). have suggested that direct contact between CD154 on CD4 T cells and CD40 on CD8 T cells may contribute to CD8 T cell activation. Although not completely ruled out, this does not appear to be necessary in the model described here. If it occurs, it is not sufficient, as demonstrated by the fact that IL-12Rβ1-deficient OT-I cells do not respond. Furthermore, it would not appear to be required, since administration of IL-12 can bypass the need for help and thus for CD154 on CD4 T cells. Activated DCs produce IL-12 and in fact the DC subset known to cross-present Ags to CD8 T cells in vivo and after CD40 activation are high producers of IL-12. Although DCs resident within heart tissue of Act-mOVA mice express the self-SIINFEKL/Kb Ag on their surface (data not shown), we have been unable to detect donor-derived DCs within secondary lymphoid tissue where the activation of naive T cells occurs. The processing and presentation of the Ag in this system most likely occurs through the indirect pathway by recipient (or host) DCs as determined by flow cytometry staining with congenic markers to distinguish donor from recipient DCs (data not shown). Under conditions of surgical trauma and ischemia to the donor heart, there is likely shedding of Ag into the blood (either cell associated or free), which is then picked up and processed by recipient DCs within the secondary lymphoid tissue. It is also possible that the DCs resident within the donor heart migrate to the secondary lymphoid tissue and the migratory DCs are then ingested by recipient DCs. This system cannot distinguish from donor DC ingestion or free Ag release. The indirect pathway of Ag presentation in the rejection of solid organs has been under intense investigation over the last several years and is growing in importance in processes such as rejection (40, 41) and tolerance induction (42). This transplant model enables us to look at the importance of the indirect pathway in both the process of graft destruction and graft preservation. In this system, the DCs that activate the CD8 T cell to proliferate and clonally expand in the presence or the absence of OT-II cells are likely of the same subtype since the graft is the same, the location of the OT-I cells within the secondary lymphoid tissue is the same, and the kinetics of the OT-I response is the same (Fig. 2⇑). Our data would account for how a DC subtype could be tolerizing in one circumstance and immunizing in another, depending on whether or not the DC has been activated to produce the third signal needed to support CD8 T cell differentiation. Whether the CD4 T cell-conditioned DC that produces the IL-12 is the same DC subtype that provides signals 1 and 2 to the CD8 T cell remains to be determined. The demonstration of IL-12 production by a CD4 T cell-conditioned DC provides the necessary connection between CD4 T cell help and the third signal to assist CD8 T cells to produce IFN-γ and kill targets expressing their Ag (Fig. 7⇑). We could then suggest a model in which the production of signal 3 could come from the same DC that induces CD8 T cell proliferation or from a CD4 T cell-conditioned DC (Fig. 8⇓). Model for CD4 T cell help to induce CD8 T cell effector function. CD4 T cells induce IL-12 production by DCs through CD154-CD40. The IL-12 (signal 3) is necessary for the development of cytotoxic CD8 T cell activity. In summary, our data have provided a link between CD4-dependent conditioning of the APC and the production of a third signal essential to the development of CD8 effector function. Clarifying the role CD4 T cell help plays in the development of CD8 effector function may help to develop new strategies to block an immune response such as graft rejection or to optimize vaccine or antitumor strategies for inducing long-lasting immunity. We thank Dr. Erik Peterson for careful review of this manuscript. ↵2 Abbreviations used in this paper: DC, dendritic cell; mOVA, membrane-bound OVA; Act-mOVA, actin promoter mOVA; CD40L, CD40 ligand. Itano, A. A., S. J. McSorley, R. L. Reinhardt, B. D. Ehst, E. Ingulli, A. Y. Rudensky, M. K. Jenkins. 2003. Distinct dendritic cell populations sequentially present antigen to CD4 T cells and stimulate different aspects of cell-mediated immunity. Immunity 19: 47-57. Hernandez, J., S. Aung, K. Marquardt, L. A. Sherman. 2002. Uncoupling of proliferative potential and gain of effector function by CD8+ T cells responding to self-antigens. J. Exp. Med. 196: 323-333. Curtsinger, J. M., C. M. Johnson, M. F. Mescher. 2003. CD8 T cell clonal expansion and development of effector function require prolonged exposure to antigen, costimulation, and signal 3 cytokine. J. Immunol. 171: 5165-5175. Grabie, N., M. W. Delfs, J. R. Westrich, V. A. Love, G. Stavrakis, F. Ahmad, C. E. Seidman, J. G. Seidman, A. H. Lichtman. 2003. IL-12 is required for differentiation of pathogenic CD8+ T cell effectors that cause myocarditis. J. Clin. Invest. 111: 671-680. Steinman, R. M., S. Turley, I. Mellman, K. Inaba. 2000. 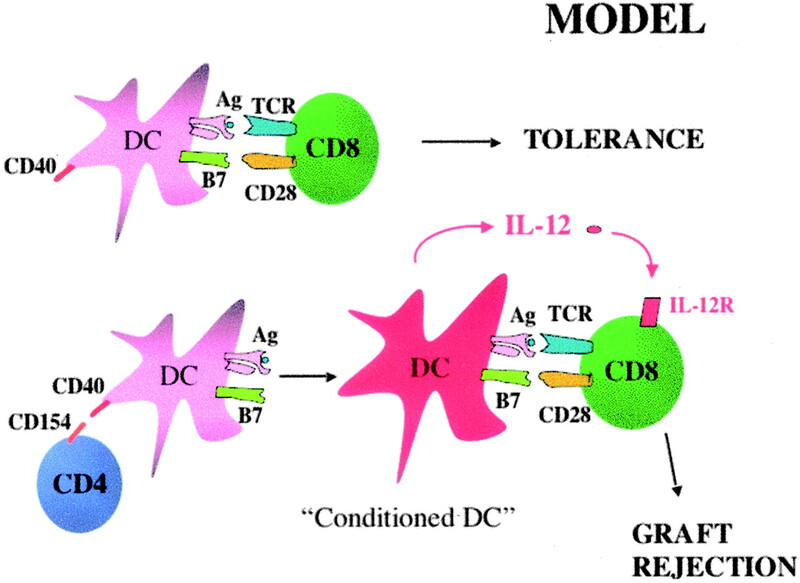 The induction of tolerance by dendritic cells that have captured apoptotic cells. J. Exp. Med. 191: 411-416. Schmidt, C. S., M. F. Mescher. 2002. Peptide antigen priming of naive, but not memory, CD8 T cells requires a third signal that can be provided by IL-12. J. Immunol. 168: 5521-5529. Curtsinger, J. M., C. S. Schmidt, A. Mondino, D. C. Lins, R. M. Kedl, M. K. Jenkins, M. F. Mescher. 1999. Inflammatory cytokines provide a third signal for activation of naive CD4+ and CD8+ T cells. J. Immunol. 162: 3256-3262. Pulendran, B., J. L. Smith, G. Caspary, K. Brasel, D. Pettit, E. Maraskovsky, C. R. Maliszewski. 1999. Distinct dendritic cell subsets differentially regulate the class of immune response in vivo. Proc. Natl. Acad. Sci. USA 96: 1036-1041. Rosenberg, A. S., A. Singer. 1992. Cellular basis of skin allograft rejection: an in vivo model of immune-mediated tissue destruction. Annu. Rev. Immunol. 10: 333-358. Smith, C. M., N. S. Wilson, J. Waithman, J. A. Villadangos, F. R. Carbone, W. R. Heath, G. T. Belz. 2004. Cognate CD4+ T cell licensing of dendritic cells in CD8+ T cell immunity. Nat. Immunol. 5: 1143-1148. Deeths, M. J., R. M. Kedl, M. F. Mescher. 1999. CD8+ T cells become nonresponsive (anergic) following activation in the presence of costimulation. J. Immunol. 163: 102-110. Albert, M. L., M. Jegathesan, R. B. Darnell. 2001. Dendritic cell maturation is required for the cross-tolerization of CD8+ T cells. Nat. Immunol. 2: 1010-1017. Ehst, B. D., E. Ingulli, M. K. Jenkins. 2003. Development of a novel transgenic mouse for the study of interactions between CD4 and CD8 T cells during graft rejection. Am. J. Transplant 3: 1355-1362. Ono, K., E. S. Lindsey. 1969. Improved technique of heart transplantation in rats. J. Thorac. Cardiovasc. Surg. 57: 225-229. Reinhardt, R. L., M. K. Jenkins. 2003. Whole-body analysis of T cell responses. Curr. Opin. Immunol. 15: 366-371. Lakkis, F. G., A. Arakelov, B. T. Konieczny, Y. Inoue. 2000. Immunologic “ignorance” of vascularized organ transplants in the absence of secondary lymphoid tissue. Nat. Med. 6: 686-688. Curtsinger, J. M., D. C. Lins, M. F. Mescher. 2003. Signal 3 determines tolerance versus full activation of naive CD8 T cells: dissociating proliferation and development of effector function. J. Exp. Med. 197: 1141-1151. Xing, Z., A. Zganiacz, J. Wang, M. Divangahi, F. Nawaz. 2000. IL-12-independent Th1-type immune responses to respiratory viral infection: requirement of IL-18 for IFN-γ release in the lung but not for the differentiation of viral-reactive Th1-type lymphocytes. J. Immunol. 164: 2575-2584. Afanasyeva, M., Y. Wang, Z. Kaya, E. A. Stafford, K. M. Dohmen, A. A. Sadighi Akha, N. R. Rose. 2001. Interleukin-12 receptor/STAT4 signaling is required for the development of autoimmune myocarditis in mice by an interferon-γ-independent pathway. Circulation 104: 3145-3151. Eriksson, U., M. O. Kurrer, W. Sebald, F. Brombacher, M. Kopf. 2001. Dual role of the IL-12/IFN-γ axis in the development of autoimmune myocarditis: induction by IL-12 and protection by IFN-γ. J. Immunol. 167: 5464-5469. He, C., P. S. Heeger. 2004. CD8 T cells can reject major histocompatibility complex class I-deficient skin allografts. Am. J. Transplant 4: 698-704. Richards, D. M., S. L. Dalheimer, B. D. Ehst, T. L. Vanasek, M. K. Jenkins, M. I. Hertz, D. L. Mueller. 2004. Indirect minor histocompatibility antigen presentation by allograft recipient cells in the draining lymph node leads to the activation and clonal expansion of CD4+ T cells that cause obliterative airways disease. J. Immunol. 172: 3469-3479. Limmer, A., J. Ohl, C. Kurts, H. G. Ljunggren, Y. Reiss, M. Groettrup, F. Momburg, B. Arnold, P. A. Knolle. 2000. Efficient presentation of exogenous antigen by liver endothelial cells to CD8+ T cells results in antigen-specific T-cell tolerance. Nat. Med. 6: 1348-1354.